I am writing to tender my resignation from the Labour Party and to inform you that I have cancelled my direct debit. I will continue to vote Labour and support many of its policies and its much-needed shift Left. However, I am opposed to Labour’s approach to Brexit – and I have been patient. I have gradually but now completely lost faith in the leadership. The Brexit ballot was only advisory – even Farage accepts that. Leave misused official statistics to lie about £350/week for the NHS. All convincing estimates point to Brexit being a disaster for the economy. There’s a high risk the Northern Ireland peace process will be harmed too. Corbyn was too quick to call for triggering article 50. Since then Labour’s approach to Brexit has been confused, putting it mildly. There is enough evidence now to consider the “will of the people” to be uninformed at best and deliberately manipulated through lies and cheating at worst. Brexit could and should be stopped. I initially joined Labour in 2010. After a brief spell away, rejoined to vote for Corbyn in 2015. I voted again for Corbyn in 2016. For what it’s worth, I wrote a non-resignation letter nearly two years ago in support of Corbyn. I was hopeful for the party and supported Corbyn despite numerous criticisms. It’s great to see the membership grow and surely Corbyn deserves praise for enabling this. I’m just not convinced that the Corbyn, McDonnell, and Abbott leadership are electable, and mainstream media bias – though partly responsible – is only a partial explanation. The problems are too many to enumerate. Salient and illustrative examples include Corbyn refusing to condemn the IRA for its bombing campaign which killed civilians; sharing a platform with SWP members despite being asked and promising not to (given the “Comrade Delta” affair); appearing on a platform alongside a CPGB flag fluttering merrily in the wind; employing a former Sinn Féin staffer. The last straw for me was Corbyn publicly expressing sadness that Ken Livingstone resigned – after all the harm Livingstone has caused recently to Labour. Given the targets Corbyn’s critics choose, these are clearly misguided decisions, and harm the chances of a democratic socialist government taking power from the Tories. As I said I will vote Labour and encourage others to do so, to try to get the Tories out so there’s a chance the welfare state can be restored with sanctions and other conditionality stopped; to undo marketisation of the NHS; improve mental health care; and for a range of other important issues. I continue to be an active trade unionist in higher education. But I don’t feel I can be a member of Labour under the current leadership and with its current approach to Brexit. Today Samaritans announced that Esther McVey has left its advisory board. This is great news, thanks to hard work by groups like Disabled People Against Cuts, Recovery in the Bin, and Black Triangle — groups led by disabled people, mental health service users and survivors. Their investigations revealed McVey’s membership on the board. These groups should be confident Samaritans is on their side and should be more involved in informing policy. This episode reveals a need for a review of advisory board membership. Samaritans must win back the trust of disabled people and others who have been harmed by disability (re)assessment policies, “sanctioning”, and cuts to welfare payments. Additionally, there should be an urgent review of Samaritans’ communications policy. It is not acceptable for the same message to be copied and pasted to multiple people who are concerned about serious conflicts of interest which harm Samaritans’ reputation, potentially affecting donations and most worryingly putting people off calling. Who is responsible for decisions made in relation to mental health care budgets? How are budgetary decisions made, including evidence of how, in calculating the total health budget, mental health needs have been taken into consideration? Treasury and DH both replied citing s35 of the FOI act. Releasing discussion of options available, Treasury argued, might inhibit future “rigorous and candid assessments of options available” . DH replied similarly: “Premature disclosure of information protected under sec tion 35 could prejudice good working relationships, the neutrality of civil servants” . NHS England did reveal something of their decision making processes, naming Paul Baumann, Chief Financial Officer for NHS England, as responsible for budgets, and citing a technical document , the technical annex of which  sketches an estimate of likely growth in mental health costs over the coming years. But Treasury and DH’s responses indicate that other factors have been taken into consideration that are not currently in the public domain. A rigorous debate about options, involving the people who need mental health services as well as those who provide them, requires transparency. I am therefore writing to ask for more information concerning the reasoning behind decisions made. In particular, what discussion has there been of the following? The potential for reducing costs, e.g., by employing lower band staff or increasing involvement of voluntary services. It is important that reasoning on these issues is made public so they can be openly debated. Ontology is the study of what kinds of entities there are in the world and how they relate to each other. As Effingham (2013, p.1) explains, “You will not find ontologists rummaging around your wardrobe” cataloguing everything they find. Rather, the idea is to conceptualise more broadly the kinds of things there are, including material and abstract “things” like numbers and colours. Social ontology concentrates on entities relevant to social theorising at various levels of explanation from the sub-personal (including unconscious processes like those controlling finger tips on keyboards) to people, their interactions, institutions and beyond. Debates in social ontology, such as on ontological individualism or emergentism, can be abstract and their relevance hard to grasp. There has even been a case to “rid social sciences of ontology altogether – of all philosophized metaphysics of how the social world is” (Kivinen and Piiroinen, 2007, p.99). This short post tries to make it clearer why it’s important to think about ontology, using an example from disability activism. Here a distinction is made between impairment and disability. From this perspective, it doesn’t make sense to say that someone “has a disability”; individual people can have impairments, but it is society which determines whether someone is disabled. Note how the conceptualisation is used to unite people behind one social struggle. “… we live in a society that’s designed by, built for, and used by non disabled people. Because of poor historic attitudes to disabled people […] disabled people were effectively locked away in hospitals, sanatoriums, in care homes or other kinds of institution. “And that meant that we were excluded from the development of the way our society works, the way our buildings are designed, transport systems, education systems, machines and appliances, leisure activities and the world of work anything really that you care to think about was designed at a time when disabled people weren’t included in the process. “And that means that all these things don’t work in a way that enables us to use them. “And the upshot of all that is that in hundreds of different ways, some big, some seemingly small, its difficult for us to take a full part in all kinds of activities that non-disabled people take for granted. Whether someone with a particular impairment becomes disabled is also affected by scientific and technological advances. For instance, many people who have a visual impairment wear glasses or contact lenses and wouldn’t consider themselves disabled (see Slorach 2016, p. 37). These conceptualisations of impairment and disability, social barriers, adjustments, aids, deaf and Deaf identity, concern ontology. The debates on these topics occur naturally in social struggles and discussions of social policy, whether or not explicitly articulated as being about ontology. They also have clear implication for how social research is carried out and understood. Effingham, N. (2013). An introduction to ontology. Cambridge: Polity Press. Kivinen, O., & Piiroinen, T. (2007). Sociologizing Metaphysics and Mind: A Pragmatist Point of View on the Methodology of the Social Science. Human Studies, 30, 97–114. Slorach, R. (2016). A very capitalist condition: a history and politics of disability. London: Bookmarks Publications. Critical realism is a mess, but there are four themes in the literature. The first is ontological realism: there is some sort of reality out there existing independently of people’s minds. The second is epistemic relativism: our knowledge of reality is conditional on particular contexts, e.g., standpoints, theories, communities, conflicts of interest. The third is judgmental rationality: it is possible to decide whether one theory is better than another at explaining some phenomenon. The fourth is ethical naturalism: although “is” does not imply “ought”, the two are not independent; empirical research can help us determine what values we should hold. (i) Who is responsible for decisions made in relation to mental health care budgets? (ii) How are budgetary decisions made, including evidence of how, in calculating the total health budget, mental health needs have been taken into consideration? Treasury and DH both replied citing s35 of the FOI act. Releasing discussion of options available, Treasury argued, might inhibit future “rigorous and candid assessments of options available” . DH replied similarly: “Premature disclosure of information protected under section 35 could prejudice good working relationships, the neutrality of civil servants” . (iii) The potential for reducing costs, e.g., by employing lower band staff or increasing involvement of voluntary services. The UK government promised a “drive towards an equal response to mental and physical health” in England as part of a five-year plan. Two years later and there is little sign that any progress has been made. Calls to improve mental health services peaked this month when 20 years’ worth of former health secretaries wrote an open letter criticising the government for “warm words” but no action. There is a consensus that more funding should reach mental health care. But what should be funded and exactly how? From April 2017, payments to adult mental health services must be linked to the quality and outcomes of care provided. National guidance published by NHS England and NHS Improvement claims that doing so will improve care, “ensuring value for money and the best use of limited resources”. But there is worrying evidence that doing so might have little impact and, at worst, actually be harmful to services. How will payment for performance work? The money flows are complex. Here is a picture showing key parts of the system. How funding flows to mental health services. At the top end is the Treasury, which determines how much money health care receives, alongside all other public services. The Treasury does not directly determine how much money goes to mental health, however – it receives advice from below in the hierarchy so it can calculate a total including all other areas of health. 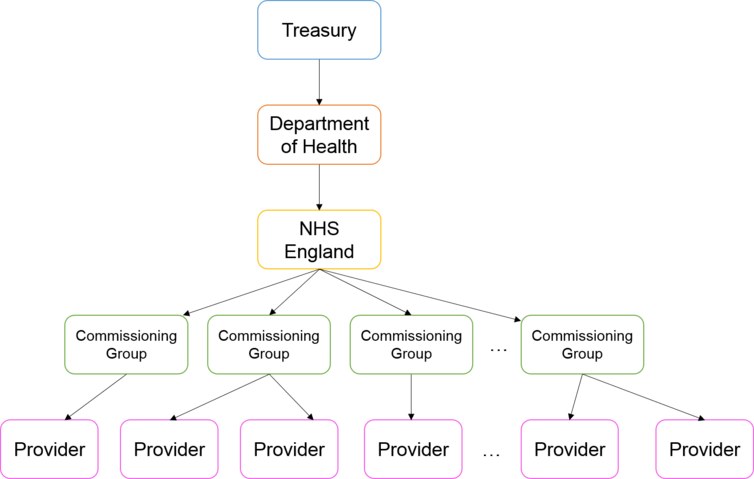 The money flows on to the Department of Health, NHS England, then Clinical Commissioning Groups which are distributed across the country. They may choose to commission an NHS Foundation Trust. They may also commission a commercial company such as Virgin Care, which recently won a £700m contract. Payment for performance will be at this final stage between commissioner and provider, and will be agreed locally between them. National guidance on how to implement the approach suggests that the chosen targets should be achievable yet stretching; informed by clinicians and people with experience of mental health problems; avoid creating an adversarial relationship between commissioners and providers; and should be used for the “reinforcement of positive behaviour”. Oxford Health NHS Foundation Trust is provided as an example in the guidance. A fifth of its income will be linked to performance, which will include ensuring that people “improve their level of functioning”, determined using two measures. One is the Mental Health Recovery Star, which tracks the progress of people who use mental health services by their ability to manage their mental health and feelings of hopefulness. This measure is completed jointly by people who use mental health services and staff providing care (such as psychiatrists, psychologists or nurses). The other measure is a checklist rated only by staff which is used to track changes in symptoms such as depression and self-injury. The service has also promised its commissioners that it will ensure people live longer. Does payment for performance improve services? A recent systematic review of research found no evidence of impact when payment was linked to health outcomes, such as how long people live – which makes Oxford Health’s choice of outcomes puzzling. There was a small benefit when payment was linked to what services actually did, for example, providing cancer screening or recording whether someone smokes, as this was much easier for services to control than were the consequences of care. 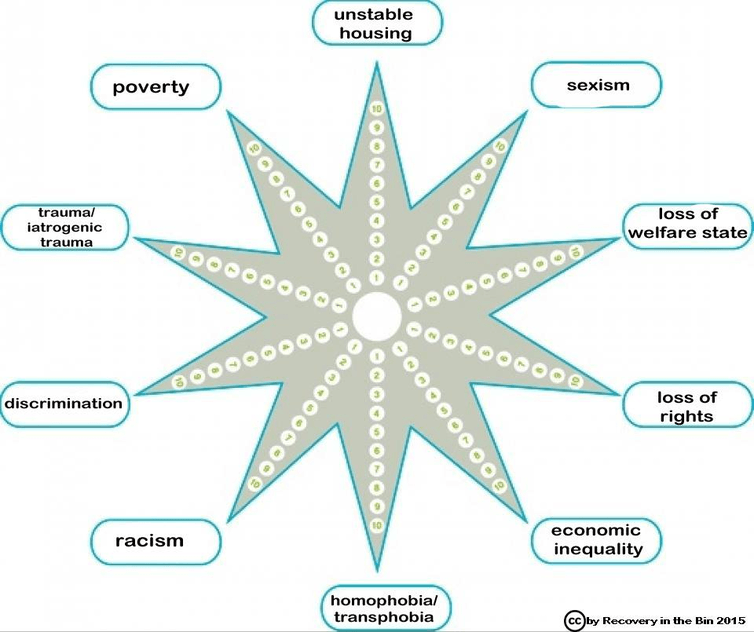 Given national advice to involve people who use mental health services in decisions about outcomes chosen, it is also curious that the recovery star has been chosen. An increasingly influential group who use mental health services, called Recovery in the Bin, singled out the measure as “redundant, unhelpful, and blunt”, and suggested an alternative focusing more on the social causes of mental distress which are often ignored in outcomes. UnRecovery Star, developed by Recovery in the Bin as an alternative to an outcome measure used in services. Putting high-stakes targets on measures tends to mean that the measures stop measuring what they are supposed to measure because people cheat to achieve the targets. The effect is so common that it has a name: Goodhart’s law. For example, ambulance services had a target to get to the patient in eight minutes for life-threatening emergencies. This led to a third of services fiddling their timings towards the target. There are various subtle ways to cheat outcome measures in mental health, such as by not bothering people who drop out of services with questionnaires to complete. People who drop out are less likely to have benefited from treatment, so excluding their answers from data analyses will improve a service’s apparent outcomes. Given the complexity of people’s experiences and predicaments, reducing them to scores on questionnaires can feel absurd, so it might be easy to justify this kind of gaming if it results in more funding which could improve the care provided. It seems especially easy for measures completed by staff who are under pressure from management to tick the right boxes. Outcomes measures have an important role to play in understanding and improving the care people receive and should be tracked as part of care, but linking them to payment risks demoralising staff and making the measures meaningless. This seems a dangerous path to take given the state mental health services are in. A better solution might lie further upstream at the Treasury when it decides how much money is available for mental health. A council in England was recently reprimanded for running an advertising campaign against begging. In a series of posters displayed throughout Nottingham, the city council claimed that “beggars aren’t what they seem”, that begging “funds the misuse of drugs” and that money given to beggars would go “down the drain” or “up in smoke”. The UK Advertising Standard Authority (ASA) upheld complaints about Nottingham City Council’s campaign, saying that it reinforced negative stereotypes against vulnerable people, and portrayed all beggars as “disingenuous and undeserving” people who would use direct donations irresponsibly. The council was ordered not to display the ads in their current form again, and to avoid using potentially offensive material in the future. But the council defended the campaign, arguing that the “hard-hitting” posters were necessary to “discourage members of the public from giving money to people who beg” on the basis that doing so would likely fund “life-threatening drug or alcohol addictions”. The posters encouraged people to donate money to local charities instead, using the hashtag #givesmart. Similar appeals have been made by other charities and councils across the UK: the borough of Kensington and Chelsea attracted controversy over its own anti-begging messages, and Nottingham City Council was ordered to withdraw a similar campaign once before, in 2004, because it wasn’t backed up by evidence. Although the council cited a blog post from a local charity in support of its claims, it’s clear that both the advertising watchdog and members of the public need to see more evidence that such campaigns prevent harm, rather than cause it. So, how could local authorities avoid such a misstep in the future? For one thing, if the aim is to prevent the harms of drug and alcohol addiction, the council could follow existing health recommendations. The National Institute for Health and Care Excellence (NICE) – the body providing advice on best-practice for health and social care in England – makes a range of recommendations for helping people with alcohol addiction, for example. This includes following an evidence-based treatment manual and charting each person’s progress to review the effectiveness of different treatments. For homeless people, it recommends residential care for up to three months – it says nothing about trying to limit the amount of money that people receive. But perhaps the council is keen to curb begging for other reasons: because it wants to satisfy members of the general public who find it a nuisance – if this were the reason it would be deeply troubling. Or perhaps it has a rationale for how cutting money to people begging might somehow treat those who have drug and alcohol problems and not cause anyone harm. In any case, the council needs to be transparent about its aims and the evidence it has about the potential impacts of such campaigns so that an informed debate is possible. There are many factors to take into account when evaluating the benefits and detriments of an ad campaign like this one. For instance, it would be useful to know how much money is given to people begging, how many of those people have alcohol or drug problems and how many seek out, or are given, support by local charities. We would also need some hypotheses; for example, that the campaign will cause donations to local charities to rise, or drug and alcohol difficulties to fall among people who beg. These could be tested by tracking donations, or conducting surveys with people who beg both before and after the intervention, while taking account of any other factors that might have led to change. Of course, the outcomes of such research can vary greatly, depending on whose perspectives you include. For example, Camden and Islington councils once asked locals their views on diverted giving (donating to charity, rather than directly to people in need). While 36% were positive, only 2% of people who were actually begging thought it was a good idea. A man and a woman, who had previously been the subject of a Criminal Anti-Social Behaviour Order (CRASBO), were not homeless but travelled in to the city centre to beg for cash to fund their drug and alcohol addictions. The man would act as a look-out for his partner while she begged in shop doorways. My bru [social security] money ran out and I had nae money. I have got a criminal record, so the choice was go back tae being a criminal and dae crookin’ and that or dae beggin’ and no get the jail. I am sick of the jail and that, so I decided tae dae beggin’. Complex social and behavioural questions such as this can easily result in a complicated web of causes and effects. But mathematical tools such as causal networks may help: these can be designed and analysed using special software, which enables researchers to visualise the relationships between different factors in a diagram. 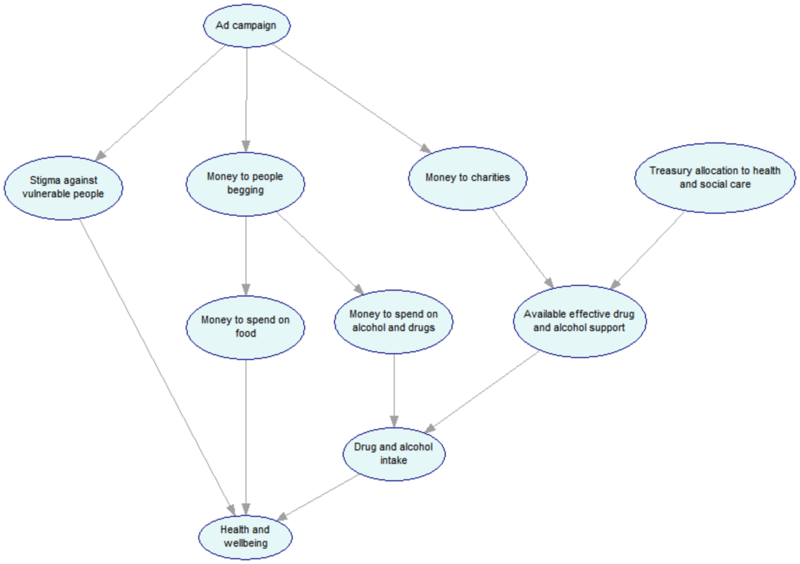 Example network of causal relationships. Each of the circles and arrows has a mathematical meaning: researchers can constrain the networks using data collected from studies, or try out invented scenarios to explore the consequences of different policies before any is implemented. All evaluations of complex interventions will make assumptions and have limitations; these diagrams can be used to make those assumptions explicit, and sound out where more research is needed. Of course, all this is just a brief sketch of the complexities involved. Given the information released so far, it is unclear how deeply the council considered the potential harms or benefits of this campaign. Perhaps using causal networks to explain how they thought it would work, and what adverse effects had been accounted for, would help to reassure the public. It’s vital that local authorities make use of research to understand the unintended impacts of policy – especially when it affects the most vulnerable people in society.